What Forum Should I Use? You are here: Home / Publishing / What Forum Should I Use? There are numerous forum scripts out there, each providing their own different level of functionality. It can be a pain trying to decide what one is right for you. In this article, I’ll attempt to summarize some of the most popular forum scripts (that are, for the most part PHP and MySQL based), along with the process of selecting one that is best fit for you and your needs. A forum, from dictionary.com’s third definition of the word, is “An assembly, meeting place, television program, etc., for the discussion of questions of public interest.” Forums have become extremely popular add ons to sites because they can allow visitors to discuss issues that may or may not be talked about on the existing site. It also encourages users to stick around, which is always beneficial when seeing how long users spent on your site. Sometimes, entire sites and portals are even built around a simple forum, so a use of a forum can greatly extend outside just a place to “chat”. There are hundreds of forum scripts we could look at, but for all intents and purposes, I’ll be looking at some of the most popular options, with the first being the well know Vbulletin. Others I’ll be mentioning include Vanilla, Simple Machines, PunBB, phpBB, bbPress, Invision Power Board, and miniBB. As you can see, the base categories that help the script grow and expand – theme support and plugin support – are found in all of the forum scripts we will be mentioning today. But, that does not mean all scripts are created equally. I have found myself using just about all of these scripts at some point in my past. The only script listed above that I have not used is Simple Machines Forum. Out of all of them, my most recent favorite is Vanilla, for its different looking interface and non-bloatware package. I have had extensive experience with Vbulletin, Invision Board, and phpBB in the past, but I have not used IB and phpBB in the past few years, which puts me behind in their newest features, so I can not really comment on the systems. Meanwhile, if you can and are looking to go the paid route for your forum, Vbulletin is the definitive choice. A huge amount of themes already exist for VB (both free and paid), and some of the hacks available add quite the wide range of additional features to your community. Vbulletin licenses come in two versions: leased ($85.00) and owned ($160.00). Both include support options via email and community forum, and phone support is also available for both licenses at an additional fee. Vbulletin can also run full featured portals almost effortlessly, such as the music portal Absolutepunk.net. Here is a quick rundown at some key points for each forum system as I remember or have had experience with. Vbulletin – Easy to skin, colors can be edited right from the admin cp, admin control panel contains options for just about everything, lots and lots of hacks, tons of themes already available, great community behind it. Vanilla – My favorite of late. Topic focused, different “default” interface, add ons that activate in one click almost all of the time, a few themes / styles currently available, very lightweight and simple. bbPress – Great integration with WordPress (obviously), tag based, simple and clean. Still, one of the main reasons I have yet to use bbPress yet for an extended period of time is because it seems a bit underdeveloped still (still relatively new). Seems like a good solution for a simple support forum. phpBB – The last time I used phpBB, version 2 was being released. At the moment of writing, version 3 is nearing completion, and what I’ve seen from the test board, it is looking pretty damn nice. I am definitely giving this a try as soon as 3.0 final is released. punBB – punBB is very lightweight, but still has a nice collection of themes and plugins already available. It can be modded very nicely, and fit into almost any site design you currently have. The admin panel is very simple and doesn’t provide much, which could be a downfall to some people who need an extensive admin panel to find their way around. MiniBB – MiniBB is essentially the same as punbb, but even more lightweight. I made the mistake of running our forums off of minibb, and I’ve been disappointed with the results. Minibb has very few extensions, and the best ones require you to pay for them (such as private messaging). If you are stuck between punbb and minibb, please go with punbb, as it is a much better choice. A common question you have to ask yourself before choosing a forum for your site is whether to go the free or paid route. Of the forums listed above, both Vbulletin and Invision Board are paid, while all the others are free. My main suggestion: look at the forum you plan to open before just jumping ship and getting a paid version. 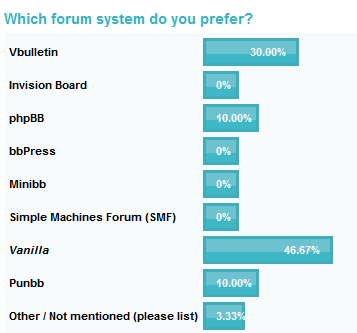 If you plan on having a large board or basing your entire site off of a forum script, Vbulletin is the right option for you. It does two things: shows people you are serious about your forum or portal and willing to spend some money on it, and guarantees you’ll have support, so you won’t have to worry about problems popping up that take weeks to get figured out. The other paid option, Invision Board, may also be something to look into, but Vbulletin, for about the same price, has a much bigger user base that may be able to help you or have that perfect hack / add-on you may be looking for already released. When do you use the free route? In almost any other situation, choosing a free forum script will meet and succeed your demands just fine. If you plan on opening a small community for your product or service (application, hosting, etc), or if you just want to have a lightweight community just to give that extra “connected” feeling to your visitors, a free solution will work fine. There is no need to spend money on licensing if your forum isn’t going to play a major role on your site. The results of a Mintpages poll, conducted over 2 and 1/2 weeks, shows the results. Always look into plugins and hacks you may be requiring in the future before taking the time installing a forum script. Imagine your forum at the beginning when it is small, and further down the road when it is larger. What additional features might you want to have? Almost all forum scripts have hack / plugin directories that will list add ons that have been released and even ones that are still under development. It is important to try to plan ahead, and not just think about what’s needed “now” which might not be anything if you are just opening up a forum for the first time. Another things to keep in mind is your server and what it can handle. Extremely large user databases can put a lot of pressure on a weak server if you have thousands of members active a day doing the usual forum related activities of posting, searching, etc. Make sure you are on a server that can meet the need of your forum and user base. Now it is your turn. What is you favorite script? What ones have you had totally horrible experiences with, and what ones have been lifesavers to you? I want to hear what you think of the choices above, or maybe fill me in on one I should have mentioned. Let it all out in the comments.